Activision has announced that Call of Duty: Modern Warfare 2 will be coming to the Nintendo DS this fall. The game is called Call of Duty: Modern Warfare 2: Mobilised and the game is so big it has two colon's in the title. The game is set to feature building to building combat, UAV control, tank control and the ability to man the AC-130 gunship. It's unclear if the game has co-op play, but apparently the six player multiplayer mode was so awesome they named it twice in the press release. Sounds a lot like the ever popular growing Horde-style modes we are seeing in games. Ones that are traditionally co-op. We'll be keeping an eye on this one and let you know as soon as we have official word on the co-op mode. London, UK– 3rd August, 2009 – On the 10th November get ready for more high-speed action, as Activision Publishing, Inc. revealed plans today to deploy Call of Duty: Modern Warfare: Mobilised for Nintendo DS™. 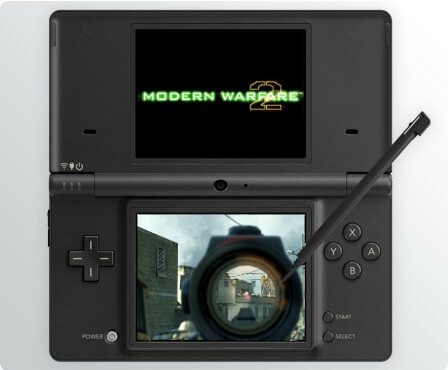 Developed exclusively for the Nintendo DS by n-Space, Call of Duty: Modern Warfare: Mobilised will deliver an arsenal of cutting-edge weaponry, vehicles and tactics, arming players with precision controls for battle across the world’s most dangerous hotspots. Gamers will fight on the ground in intense building-to-building tactical combat, hack into enemy computer terminals, take the controls of military vehicles like Battle Tanks and UAV spy drones, or man the guns of an AC-130 gunship. Call of Duty: Modern Warfare: Mobilised will bring the epic Call of Duty intensity of Modern Warfare to Nintendo DS fans through a unique storyline and companion narrative. The title will also serve up a array of features, including a six-player online multiplayer mode that allows friends to host their own server, as well as the brand new Survival Mode, giving players a variety of weapons to hold off waves of oncoming enemy forces and an expanded six-player online multiplayer mode. Also, Arcade Mode will allow gamers to replay the game’s single-player with a time limit and running score, with extra points awarded for specific achievements. Call of Duty: Modern Warfare: Mobilised will release worldwide on 10th November, in conjunction with Infinity Ward’s highly-anticipated Modern Warfare 2, the next instalment to the record-breaking Call of Duty series and is rated 12+ by PEGI. Page created in 0.7506 seconds.